Result: Mischa Zverev defeated Lukas Lacko in Eastbourne Tennis Intl 2018 by 6-4, 6-4. It was an eye catching performance between Mischa Zverev and Lukas Lacko as they both gave a very outstanding performance. The German star player, Mischa Zverev took a perfect start by opening the scoring of the first set with a powerful shot. On the other hand, Lukas Lacko was also scoring points but at a very slow pace. However, the set eventually came to an end and Mischa Zverev sealed his victory in the first set by two points upfront. It was a shocking defeat for the Slovak player as he could lost the final if he loses the next set. The second set started after a short break and this time Lukas Lacko took the lead. While, Mischa Zverev was also scoring points quickly. 👏 Mischa Zverev is the 2018 #NatureValleyInternational Champion! Both the players were scoring points at a very fast pace and after some time the match became more exciting when the score reached 5-4 with Mischa Zverev leading upfront. At last, it was Lukas Lacko who lost the last two points in a quick succession and failed to clinch the title of Eastbourne Tennis Intl 2018 from the German. 🏆The elder of the Zverev brothers finally gets an #ATP title at the age of 30, as #67 Mischa #Zverev 🇩🇪 defeats #94 Lukas #Lacko in straights, winning #Eastbourne 🇬🇧 250! 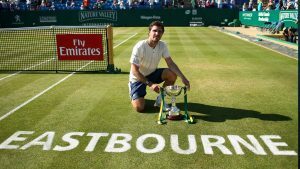 Mischa Zverev finally won by 6-4, 6-4 from Lukas Lacko and claimed his first ATP title in Eastbourne. Result: Caroline Wozniacki defeated Aryna Sabalenka by 7-5, 7-6(5). An absolute and breathtaking performance was witnessed by Caroline Wozniacki and the Belarus star player, Aryna Sabalenka in both the sets. Caroline Wozniacki opened the scoring of the first set but she failed to extend her lead large enough for her opponent. The 20-years old, Aryna Sabalenka was also scoring points at a very swift pace. Both the players were playing confidently and the match became more excited, as the score was levelled at 5-5. However, in the end, Aryna Sabalenka lost the first set as she failed to score the last two points in a quick succession. The next set started after some time and Aryna Sabalenka took a perfect start by taking the lead this time when Caroline Wozniacki failed to score on her serve. Both the players were scoring points quickly and the match looked stranded after some time.
.@CaroWozniacki reunited with the WTA Eastbourne trophy. However, after a tough fight between the two players, the set eventually came to a tie-breaker as the score were levelled at 6-6. In the tie-break, Aryna Sabalenka got into pressure and lost a total of three points on her serves which costed her the second set. At last, Aryna Sabalenka faced defeat in both sets and failed to win the Eastbourne Tennis Intl 2018 title. Although, Caroline Wozniacki made two double faults as compared to Aryna Sabalenka who made only one, but still the Belarus professional faced defeat in both the sets. Caroline Wozniacki finally won her 29th career trophy and is now looking forward to clinch the Wimbledon Open 2018 title. Result: Gabriela Dabrowski and Xu Yifan defeated Irina-Camelia Begu and Mihaela Buzarnescu in Eastbourne Tennis Intl 2018 by 6-3, 7-5. Although, Irina-Camelia Begu and Mihaela Buzarnescu opened the scoring of the first set but they failed to extend it large enough for the opponent pair. A tough battle was seen in the opening set, as both the pairs were struggling hard to win it. But in the end, Gabriela Dabrowski and Xu Yifan claimed their win in the first set as Irina-Camelia Begu and Mihaela Buzarnescu lost many points on their serve. In the second set, Gabriela Dabrowski and Xu Yifan took the lead this time and were playing confidently. They both not only took the lead but were constantly scoring points, while on the other hand, Irina-Camelia Begu and Mihaela Buzarnescu were also gaining points at a very fast pace. In the end, Irina-Camelia Begu and Mihaela Buzarnescu faced defeat in the second set as they both failed to score points on a total of two serves. Gabriela Dabrowski and Xu Yifan finally won the Eastbourne Tennis Intl 2018 doubles title and now they have become the favourites in Wimbledon Open 2018.